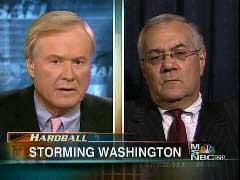 On last night's Hardball Chris Matthews invited on Rep. Barney Frank to defend the wild claim Frank made during the Hurricane Katrina hearings: "We have to do more, because here’s what I have to say and I hate to have to have to say this about my own government. But I believe what we are seeing with regard to New Orleans and the surrounding area is a policy frankly of ethnic cleansing by inaction." Tim Graham blogged about it here but a quick survey of MRC analysts reveals MSNBC's Hardball has been the only network show to touch on the remark. This is a far cry from the reaction Pat Robertson received for his controversial remarks especially when you consider the arguable relevance he still has at least compared to Frank's status as a current sitting member of Congress. Matthews: "Welcome back to Hardball. Hurricane Katrina recovery efforts are under fire again this week as more hearings get underway on Capitol Hill, and storm evacuees are here in Washington by the hundreds to demand more help in rebuilding their homes and their lives. Massachusetts Representative Barney Frank met with some of them yesterday and here’s what he had to say." Matthews: "Congressman Barney Frank of Massachusetts here right now to talk about what he meant by that, and what he thinks needs to happen to improve the situation. Congressman Frank, thank you for coming on today. Your remarks yesterday were pretty hot. Do you stand by them?" Frank: "Yes, although I, I see there was some potential confusion. Somebody wrote me an angry letter today and said were you accusing the president of genocide? To me there was a very sharp distinction between ethnic cleansing and genocide. Genocide is, is, is murdering people. By ethnic cleansing, and I welcome a cans to clarify this as certainly what I had in mind, I’m talking about the policy of removing a certain kind of people from an area, not, not killing them, but getting them out. And that’s clearly what’s going on in New Orleans. It is clearly gonna be the case that if the Bush administration is allowed to continue its policy, there will be in New Orleans after this is over, this period of crisis, many fewer lower income people, and particularly many fewer African-Americans. The inaction of the federal government is such that people who were destroyed, whose homes were destroyed, whose lives were devastated by the hurricane, are getting literally no assistance. They got some short-term, temporary relocation assistance, very inadequate, but this administration’s policy is so far literally to do nothing to try to help particularly lower income people build their homes and everybody understands the consequence of that. It’s going to be a much richer, much whiter New Orleans." Matthews, lending some credence to Frank's case: "Is part of this, do you think, state by state politics? Obviously, we all know from watching the returns over the years that Texas has gotten overwhelmingly Republican in recent years, and it could take a few more Democrats, in fact, several hundred thousand more, and still remain a heavily Republican state, whereas Louisiana is very close. I heard one Republican politician in Louisiana right after Katrina tell me he was quite happy with the fact or the probability that it would be fewer Democrats living in Louisiana because of this evacuation. Do you think it’s more than just the statistics here? Is there some effort to keep the people they helped relocate in Texas?" Frank: "Well, that’s why I said inaction. No, I don’t think it is, nobody has deliberately tried to get the African-American population out, but I think the fact that one consequence of the inaction is going to be exactly as you said, a Louisiana that’s much more Republican, a Louisiana, it’s one of the few southern states now which continues to have a Democratic senator. Yes, I do believe that there are Republicans, look, Karl Rove plays it this way and, again, that’s what I said by inaction. I am not accusing them of deliberately driving people out. I am saying that the fact that the result of their total refusal to help lower income people rebuild housing will have that political effect, it’s kind of icing on the cake." Matthews: "Do you think there had to be a conversation among the people involved like Rove or do you think it could have been an assumption they all shared and they quietly agreed upon it?" Frank: "Well, I think it’s the other way around. Let me put it this way. If in fact the consequence, and I want to be very clear. There’s a unanimous, bipartisan consensus in Louisiana to do things. I’m supporting a bill run by the senior Republican from Louisiana in the House, Richard Baker, to try and get some funding back into this state for everybody, but I think the answer is this. I think if the consequence of doing nothing, which they are doing, to rebuild, to help lower income people rebuild, I think if that were politically negative for them, they would take that into account. In other words, it is the, they don’t feel any problem that this is going to be politically good for them, and so I think it’s the absence of a political motive to do the right thing." Matthews: "Are you sure, Congressman, that ethnic cleansing doesn’t include killing people? I’m thinking of how we first learned that phrase and how most of us think of it as, from over in the Balkans and wasn’t there an effort by Milosevic? I know he’s on trial for something over there, and I don’t think it’s just separating from one group from another." Frank: "Yes, well, there was also a specific, he’s been specifically accused of genocide with regard to one place, and I welcome this chance to clarify this. I mean, as I understood ethnic cleansing, as I use it, and there have been other proposals. Some of them were extreme right-wingers in Israel who said well, we want to get rid of the Palestinians in the West Bank. So I distinguish between genocide and ethnic cleansing. And as I said, I welcome the chance to do that. It is a, and by the way, there is this clear concept in American law, it is one thing, a terrible thing, to do something wrong. It is a lesser bad thing but still often a legally culpable thing to have something bad happen that you could have prevented and not lift a finger to prevent it. And that’s, again, I want to stress the substance here. There is zero proposals by the Bush administration to help rebuild low income housing. There was public housing, subsidized housing, homeowners that had low income housing. They are getting virtually zero help and what that means is sure, people who are wealthy enough, they will be able to rebuild, so it is clear to anyone who looks at this that the consequence of the federal government refusing to help moderate and lower income people build is going to be this consequence." Matthews: "Thank you very much. U.S. Congressman Barney Frank of Massachusetts. In the next segment Matthews did bring on Republican Sen. David Vitter to counter Frank.